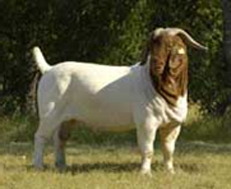 The Boer goat is primarily a meat goat with lop ears showing a variety of colour patterns. It is used very effectively in South Africa due to its browsing ability and limited impact on grass cover. They produce weaning rates in excess of 160%, are low maintenance and have sufficient milk to rear an early maturing kid. A kidding rate of 200% is common, puberty is reached early, usually 6 months for the males and 10-12 months for the females. They also have an extended breeding season The Traditional Boer goat has a red (brown) head and a white body. The Non-Traditional Boer goat is all red. The non traditional, red or Kalahari Boer is merely a color variation of the Boer goat and as such are all considered to be Boers and placed in a single breed registry. The Canadian Meat Goat Association requires DNA verification of parentage for registration and thereby insures that registered Boers are pure Boer genetics.